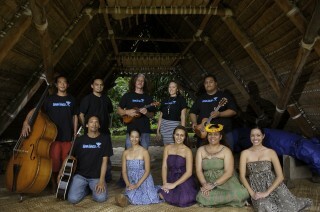 Our Mana Mele program links pro artists and innovative, positive music with youth. This allows us to teach our ABC’s through Music – Academics, Business and Culture – while raising awareness and support of initiatives aligned with Mana Maoli’s vision and mission. Since 2001, Mana Mele has been primarily a volunteer-driven program, with well over 200 artists – who we refer to as the ‘Mana Maoli Collective’ – donating their time and talent in support. 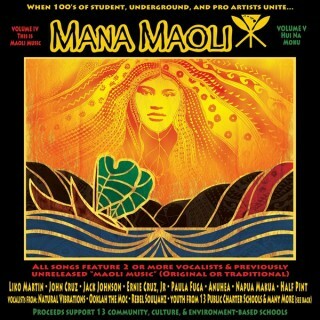 This ranges from student and underground prodigies to Hawaiiʻs favorite and most respected artists across many genres, such as Aunty Genoa Keawe, John Cruz, Jack Johnson, Paula Fuga, Amy Hanaialiʻi Gilliom, Liko Martin, Ooklah the Moc, Natural Vibes, Anuhea, Rebel Souljahz, The Green and many more. They have contributed to the youth, their communities and the Hawaiian charter schools via school visits, intersession mentorships, afterschool ‘Mana Mele’ classes, cultural exchange tours to Aotearoa (NZ), and Mana Maoli CD’s and concerts (details of each can be found below). Now, after over a dozen years of discussion, dreaming, visioning, planning, and fundraising, we have secured enough resources to begin the most exciting aspect of Mana Mele’s strategic plan – the Mana Mele project! The Music & Multimedia Academy – an advanced, hands-on approach to educating Hawaii’s youth. As they learn their Academics, Business, and Culture (ABCs) through the theme of music and multimedia, graduates will be college/career ready, culturally grounded, and community-minded. A key feature of the Academy curriculum is connecting youth to mentorships with local musicians, engineers, videographers, and event planners/promoters – on campus and in real-world settings. We are currently developing and piloting curriculum across 10 community and environment-based, charter schools on Oʻahu and Kauaʻi. Once complete, students will be able earn all the Language Arts, Math, Science and Social Studies credits, needed to earn their high-school diploma. The 4-in-1 Mobile Studio – Audio & Video Production, both Live Event & Studio capabilities. Bringing education and resources to keiki by providing a classroom and studio on wheels. In 2016 we will be extending outreach from the current 10 partner schools to 16 schools. On their own campus, students record kupuna archives and traditional or original mele/oli, create informational, instructional and promo videos, audio books, and more. Why a Music & Multimedia Academy, and a 4-in-1 Mobile Studio? For Excellence, for Clean Energy, for Community, and for Keiki. Excellence – Premier digital and analog equipment designed for industry professionals, available as a learning and storytelling tool for Hawaii’s students during school hours, and to provide high-caliber service and products to Hawai’i when used by professionals. Clean Energy – The mobile studio provides reliable and renewable energy for events, recordings and school workshops, via mobile solar panels and generator, and full battery backup. It is cost-and-energy efficient with cleaner sound. – Studio products – audio and video; i.e. PSA’s, music, kupuna archives, instructional/promo videos. This will serve as a means to simultaneously provide real-world mentorships for youth, and social enterprise options to those who want to support Mana Mele’s program offerings, and the collective of on and offstage artists who support the project. Keiki – Mana Mele supports our keiki through direct program services (as described above), and throughproviding Hawai’i Live Event Services and Studio Products (also described above), where net proceeds support these program services, and students can mentor with experienced industry professionals in real-world settings. Based at Honolulu Community College, MELE (Music & Entertainment Learning Experience) offers college degrees in Music Business & Production and Audio Engineering, with curriculum that balances academics and real world application. Formed in 1999, Mana Maoli is a nonprofit that founded and supports Halau Ku Mana Public Charter School, and runs a Mana Mele program that has primarily served Hawaii’s culture, community and environment-based charter schools. Now, MELE and Mana Maoli are honored to serve Hawaii’s community at large with the Mana Mele Project. 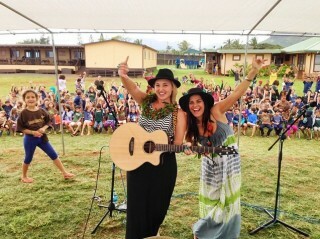 School visits – Members of the Mana Maoli Collective provide schoolwide/large group sessions that include sharing music, talking story, and QnA as a means of inspiration, learning and encouragement to our youth. During the same visit, they also often provide small group workshops, where each artist works with youth on building specific skills of their interest, e.g. songwriting, ʻukulele, and music business. Mentorships – Ranging from one session to an entire summer, music industry professionals provide music, engineering and music business mentorships for youth, such as singing, ukulele, guitar, bass, keyboards, drums, percussions, DJ turntables, radio talk show host, engineering and music management/promotion. “Mana Mele” afterschool/elective classes – As students learn to sing and play instruments, they also learn their ʻABCʻsʻ – Academics, Business and Culture. Music becomes a vehicle to learn Hawaiian culture, values, language, history, music notation and theory, music engineering, production and business, and more. 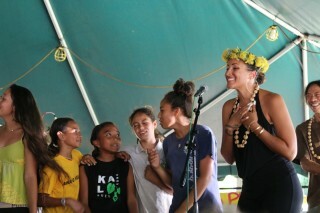 The Mana Mele project will host afterschool/elective classes at 4 Hawaiian charter schools each on Kaua’i and O’ahu. 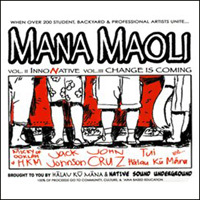 Mana Maoli CDʻs and concerts featuring student, underground and pro artists collaborating in the studio and onstage to raise awareness of the amazing success stories of Hawaiian charter schools, despite the severe funding inequities they face. Funds raised go to support Hawaiian charter schools and/or our Mana Mele program. Please see our Donations/Products page for a wide array of inspiring “Mana Mele”. 100% of proceeds from these products support Hawaiian charter schools direct, or through support of our “Mana Mele” program that focuses on serving these schools.